This snippet shows how to read a connection (or value) mapping template into a Python dictionary. Line 8 GetMappingRule uses output arguments, so we have to take the returned ISIVTCollection and extract the From and To output arguments. We use From as the dictionary key. The online store sells Standalone licenses only. No network licenses. That’s why you don’t see Linux listed (because Linux licenses are always network licenses). A network license costs about $750 more than a standalone license. 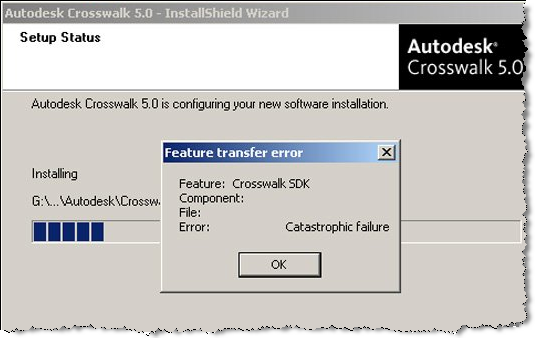 A customer reported this error during the Crosswalk install: “Feature Transfer Error – Catastrophic failure”. Actually, he posted the screenshot on his facebook page, Jennifer Goldfinch saw it, contacted me, and I ended up with the case. Happily the problem was easily solved. The md5 of his downloaded exe was wrong, so he switched from Google Chrome to Firefox, downloaded again, and Crosswalk installed just fine. Afterwards I downloaded Google Chrome to try it myself, and I didn’t have any problems with the Crosswalk download. Go figure. I didn’t see the md5 on autodesk.com/softimage-crosswalk, so here it is: 63AF7E5BA1CD27269FE2B1FD135F373C. The T2S_MentalRay addon includes copies of Softimage DLLs, such as sibase.dll, and that causes problems in Softimage 2011. I’ve had two cases of shader/workgroup problems that were resolved by removing this addon. Update: As noted in the comments, the problem is older versions of SPDL files that contain GUIDs used by the Softimage factory shaders. Addon shaders are loaded first, so these SPDLs override the factory defaults and cause problems. A Subscription customer reported getting this error during the Softimage 2010 SP1 install. I also saw this reported on the AREA for ModTool. However, these are the only two reports of this error that I have ever seen. The customer worked around the error by installing in Safe mode, but later had problems loading his C# plugins. So we tried a silent install of Softimage 2010 SP1, and that seemed to do the trick. You may have noticed that the ray3.exe executable no longer ships with Softimage. That’s because mental ray standalone 2011 now supports 3ds Max, Maya, and Softimage, so there is one mental ray product that includes the shader libraries for all supported DCC products. If you were using ray3 to check the version of mental ray, you can do the same thing with raysat -version. Hirazi Blue beat me to it, but I did have this post in draft form for awhile. Really, I did. Given a .mi file and a dll, Softimage 2011 can automatically load and register a shader. 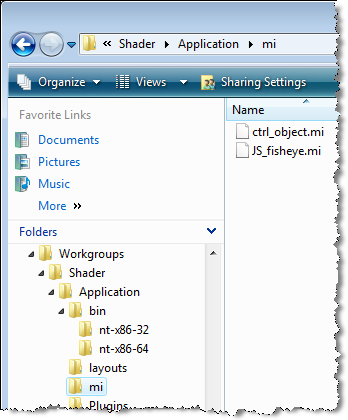 For example, in the screenshot you can see I have the JS_fisheye and ctrl_studio .mi files in a workgroup. And then drop the .mi and .dll files into the corresponding folders. Note that I didn’t get the JS_fisheye shader to work in 64-bit Softimage 2011. Even though Softimage loaded the DLL, I still got the error “// ERROR : PHEN 0.4 error 051011: shader “JS_fisheye” not found”. Dependency Walker didn’t show any problems with JS_fisheye.dll. To get your 2011 license, get your 2011 serial number and then go to http://registeronce.autodesk.com. Save your 2011 license file in C:\Program Files\Autodesk Network License Manager. On the Start/Stop/Reread tab, click Stop Server. On the Config Services tab, change the Path to license file to point to the 2011 license file. Now double-check that the 2011 license is installed. On the Server Status tab, click Perform Status Enquiry. Under “Feature usage info”, you should see a list of features like 85563SFTIM_2011_0F, 84000SFTIM_2010_0F, and 78600SFTIM_7_5F. The features with B1, B2, B3, B4, and B5 are your batch licenses. – Go to the Start/Stop/Reread tab. – Select the “Force Server Shutdown” check box. If you had a combination of Softimage 2010 and Softimage Advanced 2010 licenses, you will be getting two separate serial numbers for Softimage 2011. 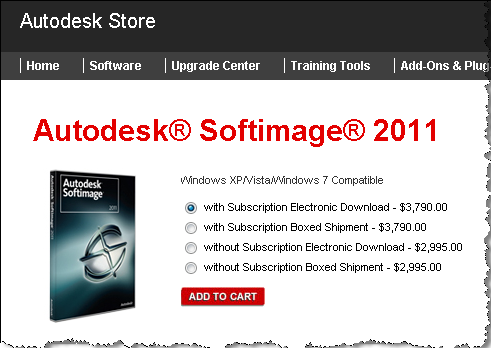 You’ll get one Softimage 2011 serial number for your Softimage 2010 license, and another Softimage 2011 serial number for your Softimage Advanced 2010 license. Unfortunately, you cannot combine the two Softimage 2011 licenses into a single license (.lic) file. Softimage and Softimage Advanced were separate products, that is why it was possible to combine the two licenses. What to do? Contact your reseller or the Business Center and ask them to combine your two serial numbers into one master serial number for all your Softimage 2011 seats.